A groundbreaking book about personal growth that presents a uniquely effective set of four tools that bring about dynamic change in the present and impart a greater understanding of the depth and complexity of the human condition over the longterm. The Toolsaddresses the most common complaint patients have about psychotherapy: the interminable wait for change to begin. Barry Michels, an LA-based therapist, was frustrated by his inability to bring his patients faster relief from the issues that plagued them. He found a mentor in Phil Stutz, a psychiatrist who years before devised a methodology that arose from a similar disenchantment. The traditional therapeutic model sets its sights on the past, but Stutz and Michels employ an arsenal of tools--exercises that access the power of the unconscious and effectively meet the most persistent problems people face--and the results are electrifying. Stutz and Michels are much sought-after--a recent profile in The New Yorker touted them as an "open secret" in Hollywood--and treat a high-powered and creative clientele. 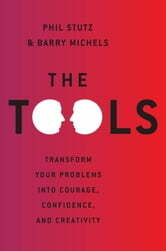 Their first work, The Toolstranscends the typical self-help genre because of its paradigm-changing material, the credibility of its authors, and the instant appeal and empowerment of its message. I have received Psychotherapy and have been able to understand where much of my behaviour and self esteem problems originated. I have tried to take this knowledge and change my thinking process and behaviour but found it very challenging. I refuse to simply blame or explain away. This book took me the next step. You not only gave great tools to use so that I feel I have some control but explained things I had been struggling with for years. Thank you so much for you efforts and thebobviois love you have for us all. I wonder if Phil and Barry are missing a key element. I suspect that human connection and support is a key element in both learning and choosing the tools they describe. Barry, for instance, describes how his parents atheism made it difficult for him to recognize and embrace faith. But I wonder if his parents' love and care also prepared him to believe that he might be capable of active love and creation.